Rosetta’s mission is to do an in-depth analysis of Comet 67P/Churyumov-Gerasimenko something scientists hope this will provide essential information to understand how the Solar System was formed. A comet’s composition reflects the composition of the pre-solar nebula, out of which the Sun and the planets of the Solar System developed, more than 4600 million years ago. What makes this mission special is that it will be the first mission to orbit and land on a comet, one of the most complex and ambitious missions ever undertaken during man’s space exploration. Scientists had to plan a ten-year trip through the Solar System. Approaching, orbiting, and landing on a fast moving object like a comet require delicate and spectacular maneuvers and as very little is known about the comets actual surface properties, choose a safe landing scenario is something that really only can be done when the spacecraft already has arrived in a proximity of its intended target. Rosetta’s lander ‘Philae’ will obtain the first images from a comet’s surface and make the first in-situ subsurface analysis of its composition. Rosetta will be the first spacecraft to witness, at close proximity, how a comet changes as it approaches the increasing intensity of the Sun’s radiation. No previous mission has had this great potential to look back to the infancy of our Solar System and investigate the role that comets may have played in the beginnings of life on Earth. The orbiter’s scientific payload is provided by scientific consortia from institutes across Europe and the United States. 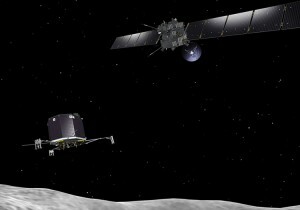 The lander is provided by a European consortium headed by the German Aerospace Research Institute (DLR). Other members of the consortium are ESA, CNES and institutes from Austria, Finland, France, Hungary, Ireland, Italy, and the United Kingdom.